To help ensure that requests are suitable for your skill, consider implementing the CanFulfillIntentRequest interface. 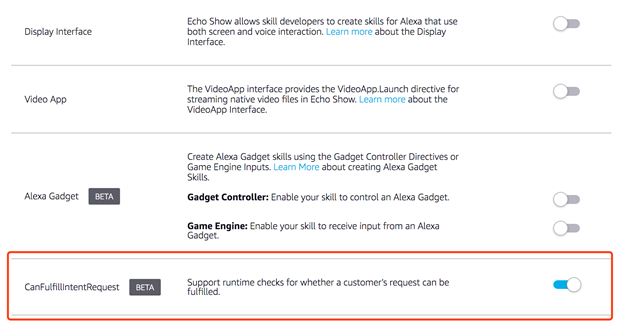 If you have used the ASK SDK for Node.js or the ASK SDK for Java in your skill development, and you want to add support for the CanFulfillIntentRequest interface to your Alexa skill, you must update to the ASK SDK for Node.js, ASK SDK for Java, or the ASK SDK for Python as appropriate. These steps may now be completed through ASK CLI, or through the developer console. To set up ASK CLI, see Quick Start Alexa Skills Kit Command Line Interface. Create a new skill if desired. To add support to your skill for CanFulfillIntentRequest, edit the skill.json file, which contains the skill manifest. Edit the skill information file to include "CAN_FULFILL_INTENT_REQUEST" as a new interface type entry. In the following sample manifest, refer to the interfaces values. Thus, "CAN_FULFILL_INTENT_REQUEST" is another interface which you as a skill developer can choose to support or not. "Alexa tell hello world my name is Peter"
You can now use the command-line interface to update or create the new skill definition. Open your skill in the developer console. Go to the Build > Custom > Interfaces page, and enable the CanFulfillIntentRequest interface. Scroll to the top of the panel, and then click Save Interfaces. In the bottom right, a message should appear indicating that the skill manifest saved successfully. Note: If the skill has been published, implement the CanFulfillIntentRequest interface by making changes in the development version, and then submit the skill for certification once your changes are complete. Whether you have implemented CanFulfillIntentRequest with ASK CLI or through the developer console, the steps to implement the logic in your skill are the same. See Understand Name-free Interaction for Custom Skills. After you've updated your skill manifest and updated the code for your skill service, you can invoke the skill from ASK CLI or the developer console to test your skill's response. Create a new .json file containing the input JSON with the request type set to CanFulfillIntentRequest. The following is a sample .json file for the request. Substitute the appropriate values for your skill. Because you cannot test CanFulfillIntentRequest with an Alexa-enabled device, the purpose of this file is to duplicate the content of an actual CanfulfillIntentRequest from Alexa for testing with ASK CLI, or in the Alexa Simulator, as described in the next section. Verify that your skill handles a CanFulfillIntentRequest call with no userId present. Verify that your skill handles a CanFulfillIntentRequest call with no session information present. Verify that your skill handles a CanFulfillIntentRequest call for every intent included in your interaction model. This command writes your skill's response to the CanFulfillIntentRequest to standard output. In order to properly test your skill's response, the .json file you created must match the CanFulfillIntentRequest that Alexa would send to your skill. In the developer console, click the Test tab. In the text box, enter the JSON for a CanFulfillIntentRequest that invokes the endpoint for your skill. For aa sample .json file, see create the JSON for testing your skill.